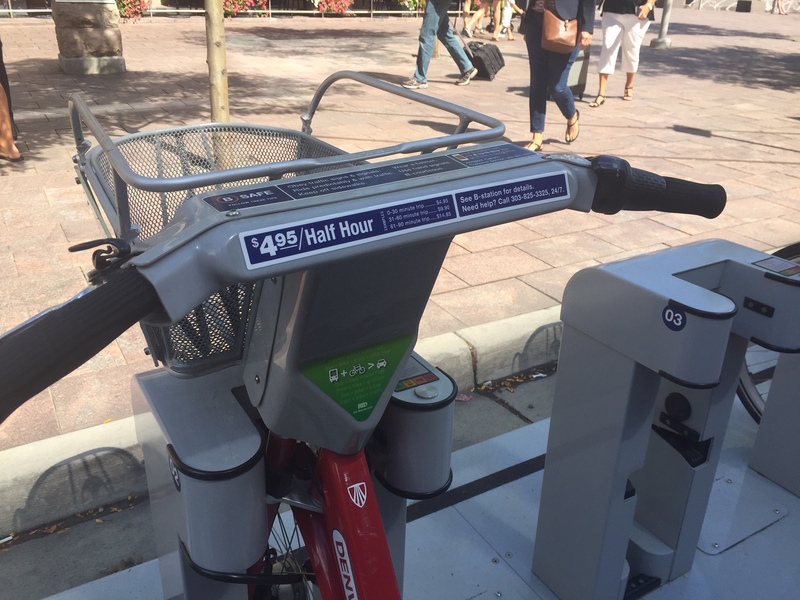 It will cost a little less to rent a B-Cycle for 30 minutes, at least until the end of August. Earlier this year, in an attempt to raise revenue while also growing ridership, Executive Director Nick Bohnenkamp eliminated the $9 day pass in favor of offering single rides of up to 30 minutes. But at $7 a pop, it was the most expensive half-hour fee in the country. The theory was that because 60 percent of B-Cycle riders use a bike just once per day, the $7 per-trip fee would be a better bargain for them and would grow the system’s base, Bohnenkamp told Streetsblog. The risk, he admitted, was that nixing the day pass would alienate other riders who want to check out a bike several times a day. This month B-Cycle is trying out a discount on the per-trip rate, charging $4.95 instead of $7. The new rate is just promotional, though, and will cease in September. Experimenting with different pricing options probably won’t hurt and might bring a few more customers on board, but what B-Cycle really needs is a better network of stations. Despite the Mile High City’s bike-friendly climate, B-Cycle’s ridership doesn’t stack up well compared to bike-share systems in other cities. The core problem is that stations are spread too thin, which makes bike-share an impractical travel option for too many trips. The city’s sparse network of high-quality bike lanes doesn’t help either — people won’t ride if they don’t feel safe. Fixing these shortcomings will take political leadership, but City Council members have yet to come up with a strategy to expand B-Cycle citywide, even though it’s one of their stated priorities this year. It isn’t a pricing model issue. Compared to other cities who have successfully implemented a bike sharing system, the station density in Denver is less than 25% of what is required to engage strong ridership. Even if the lower price engages a few new riders, if Denver wants to improve ridership beyond the occasional weekend rider or tourist, they will need to increase station density dramatically. To get engagement with daily commuters and with urban dwellers who would welcome the opportunity to also use B-cycle to shop, entertain, and travel to venues, a 3-5 block walk on average, or more, at the beginning and/or end of the journey needs to be eliminated, not to mention the need to expand the service area radius. 3 years ago, I spent almost a year trying to commute and do all my urban shopping by B-cycle. The low density made it highly impractical (I did as much walking as riding!) and little improvement has been made to date. Lower prices don’t fix this fundamental flaw, and retention rate for any new customers will be low because of it. The city needs to commit to moving this from a once-novel demonstration model to a genuine part of a comprehensive multi-modal transportation solution or it will be forever stuck in the nice, but impractical mode. I think the idea of bike sharing is interesting and compelling, but I can’t figure out why anyone would pay that kind of money to borrow a bike – a somewhat heavy and clunky bike that’s probably not going to be adjusted right for your body at that. I mean, for hundred bucks you can buy an entry level commuter bike, and set it up so it actually fits your body. Seems like you’d come out ahead in a month or two tops – and you could actually ride it all the way from your starting point to your destination. I suppose for tourists or people who just want to go for a recreational ride a few times a year it might make sense – but with prices like this, I honestly just don’t understand why anyone would use this service on a regular basis. Seems like high quality secure bike parking stations would be much more valuable. What am I missing? The draw for some people is that you don’t have to store a bicycle in a small one bedroom or studio apartment or deal with the hassle of getting a bicycle stolen. I own use it occasionally when I don’t have a bicycle with me and I need to get from one b-cycle destination to another when public transit would not be faster. If I could lock up bicycles securely around town for myself that would work, but its much cheaper to use the bcycle than creating my own personal bicycle network. Ha! I never would have thought of creating a personal bike network! Maybe this is why I occasionally see bikes locked up in rather random locations for days at a time??? As a person who’s not out and about all that often, it would never occur to me that people might make lots of trips that don’t either start or end at home! But thanks… I enjoy hearing how people are actually using these services. I struggle with the daily rate and battle with myself on whether to buy extra annual passes for when friends and family come into town. I think I’ll end up getting the monthly pass and just activating it when I know people are coming to town who will use it. But personally, I use it a lot with an annual pass. I’ve only got a somewhat expensive road bike so when I go downtown I don’t have to worry about my bike being stolen. When I bus to work in Aurora and have a meeting Downtown after work, I can just take the A line into town and B-Cycle home afterwards. It’s really just another form of transit and really functions pretty closely to how Car2Go functions. It’s nice to go to LoDo and not have to worry about fitting your bike in an Uber when an afternoon thunderstorm hits too. It’s just another option. Really the only criticism I have is that it’s a small network footprint. Would have loved to take it to my conference at DU or get off at 38th and Blake to ride home from the airport last Sunday night instead of going to Union Station, or take it to the VA when I have a doctor’s appointment. OK… I didn’t realize there were annual and monthly rates – that makes much more sense. I live in the transportation desert of southwest Denver, so I’m not familiar with any of the options (we have no light rail or decent bus service, no car2go, no B-cycle – so it’s all rather theoretical from my perspective). But the idea of combining bike share with light rail makes complete sense now. Thanks so much for sharing your experience! Of course! There’s been talk of at least expanding Car2Go city wide like Seattle. I’ve heard rumblings of the same happening with B-Cycle as well, but I’m less optimistic about that in the short term. It’d be nice to be able to give all Denverites like yourself multiple transportation options! It would be great if we had more options, but I think there are challenges in this part of town. The population density is rather sparse with mostly single family homes. It tends to be either big families of folks without much money crammed into small houses – the kind of folks for whom the price point is critical – or single people who could afford various options, but there aren’t enough of us to support the system. Not sure what the best transportation solution for this area would be, but my hunch is that it probably won’t happen unless and until there’s some new development to support it. They need to expand the network from a city center model to a neighborhood model. If you live in Wash Park, Park Hill, Sunnyside, City Park, or Sloans Lake and want to commute to downtown on a b-cycle good luck finding one close to your home.